The Five Platonic Solids, by virtue of form and structure, are associated with each of the five elements. 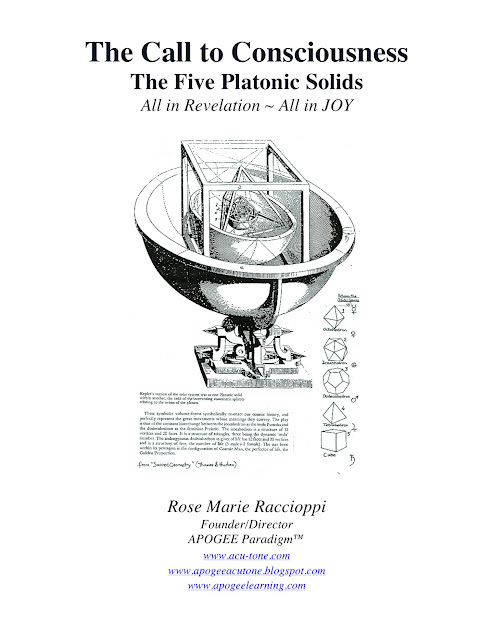 When working with the Five Platonic Solids, you become engaged in the very elements of life itself. The energies of earth, water, fire, air, ether, are brought to awareness. The interplay of each of these elements becomes known. The extent to which you are in harmonic accord with each element determines your very wellbeing. We each have an evolutionary destination. Experiences, and our resultant consciousness, can be supportive and/or maligning to our evolution in a myriad of ways. Knowing which of the five elements are not functioning in accord with our wellbeing, allows for conscious action and desired change. The direct biofeedback evaluative process of APOGEE Acu-Tone™ provides an energetic profile of response to each element. These findings define the restorative frequencies that will bring balance, accord and a newly experienced state of wellbeing. Do consider that the Wisdom of Creation, The Universal Mind, are part and parcel of each of the Platonic Solids. The rocks and minerals of our planet consist of the crystalline lattices created by the elements. The cells, tissue and organs of our bodies are manifested through these forms. Appreciate the form and function of each of the five elements as they exist in all life. They are the means of elemental expression within every environment, providing that which is necessary for developing and sustaining life. In our world, the cube creates the Earth, the icosahedron creates water, the tetrahedron creates fire, the octahedron creates the air, and the dodecahedron creates ether. All are contained within the sphere that is our planet. All are contained within our bodies, our consciousness, our very existence. Integration, balance and accord of each of the elements determine the functioning health of all living forms, be they animal, plant or mankind. 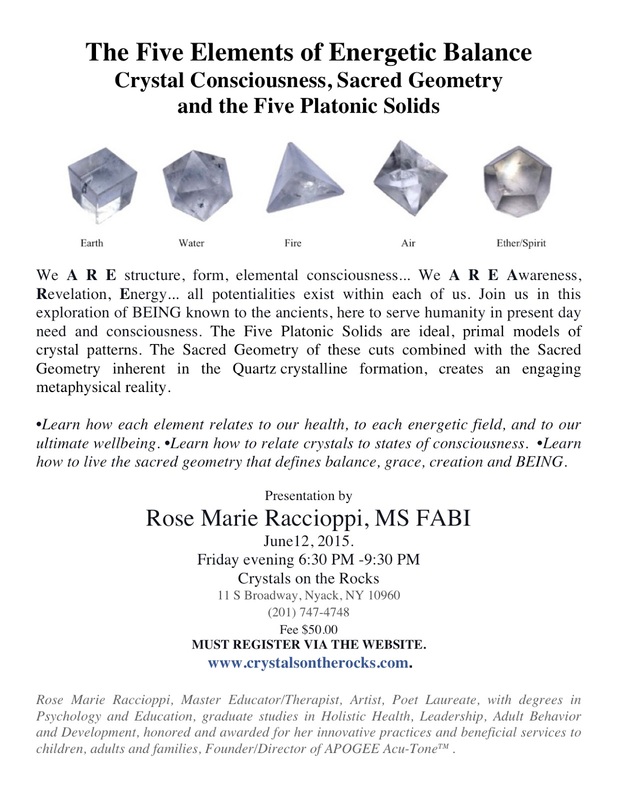 Placing the platonic solids in your home or office provides you with a universal information system. Through awareness, instinctive or learned, one can come to identify the consciousness associated with each of the elements. Such knowledge supports the refinement of consciousness through which life-affirming behaviors develop. Affirmations, visualizations, postulates, derive both purpose and power through the understanding of the operative forces within each element. To understand the physical, mental, emotional, energetic, spiritual consciousness within each of the five elements, is to understand the miracle that is YOU, the miracle that is LIFE. I have been working with Rose Marie since I am a teenager.. I am enjoying my daily work with the Platonic solids....Rose Marie is always ahead of the times..If you are interested in taking responsibility, learning and expediting; sifting and sorting that which no longer serves you; or shifting your subconscious imprinting and historical patterns that repeatedly block you; or learn how your words...thoughts and environs sabotage your goals .. then do observe the blending of her years of experience with the many tools she has created and designed to quickly and accurately access and redirect mind body spirit - it is effective.. Do not miss the event tomorrow..at the best on only place to get the ultimate education and shop for quality crystals, rocks, minerals and more! (crystal on the rocks) Rose Marie and Kim are two very gift loving souls that enjoy sharing how to implement myriad tools for self enrichment. RE: The Five Platonic Solids: These theories came from Kemet, ancient Egypt. The facts are evident in the mathematics of the great pyramids at least 5000 years before Plato or Greeks were on the scene.